A whole lot of indie games dropped on the Switch today. Here are three you should definitely check out. Are you in your twenties and have unresolved feelings about your hometown? This game is for you! You might also like it if you’re into lush art, hilarious writing, and angst. Mae Borowski and her slacker friends discover something weird and deadly in their quiet town. 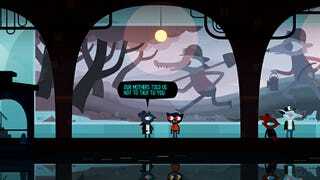 The Switch version launches with the new content that came to previous platforms earlier this year, including some new mini games and Lost Constellation and Longest Night, two short, previously released games set in the same universe as Night in the Woods. “Rhythm game” and “dungeon crawler” sound like two genres that wouldn’t fit together, but Crypt of the NecroDancer makes it work. By pressing buttons to the beat, you fight monsters and find treasure in randomly generated dungeons. It’s also got a soundtrack full of bangers, composed by Danny Baranowsky. The Switch edition comes with an exclusive character, as well as support for local co-op. I really enjoyed the sequel to this game on Switch, and I’m glad to see the original join it on the console. You play as the mining robot Rusty, the very robot you were searching for in SteamWorld Dig 2, who discovers the remnants of an ancient evil lurking underground. To uncover that mystery, you dig, find treasures, and solve puzzles in randomized steampunk and western-inspired worlds.